This past February, alumni teachers, administrators, and influencers in education came together in Austin to raise their voices by sharing ideas to look beyond the status-quo and guide the reinvention of public education in the State of Texas. 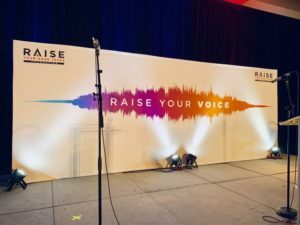 At their Leadership Symposium this year, Raise Your Hand Texas looked to push its marketing and event materials to the next level through its interactive displays, banners, easel signs, directional signage, as well as a 20’ stage backdrop and 20’ experience wall. The nonprofit advocacy group supports public policy solutions that “invests in our students, encourage[s] innovation and autonomy, and improve[s] college and workforce readiness.” This year, for their 11thannual Leadership Symposium, Raise Your Hand unveiled the theme “Raise Your Voice.” The three-day interactive event emphasized being heard both on their campuses as well as at the capitol throughout the symposium. More than 300 educators from the event converged on the Capitol to speak directly to their legislators, to make their voices, the voices of their teachers, and the voices of their students and families heard. 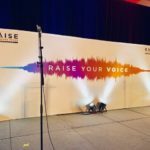 From a marketing perspective, Raise Your Hand always takes the Leadership Symposium experience to the next level. The small but talented team looks for ways to push the creative envelope when it comes to presenting the symposium, and the organization. Unique to this year, they partnered with the third-party app Soundwave Art to “enhance the overall experience and bring life to many of our print materials.” They generated 16 soundwaves that were all scannable and featured their own custom-created videos that shared stories of the many voices behind public education. The print materials highlighted the theme of the symposium and amplified the overall experience through bright colors and eye-catching designs and innovative signage. Miller provided printing of several of the necessities for a symposium of this size—from the direct-to-print directional signage for the conference space itself, to a 20’ Hop-Up that gave a backdrop to presenters and acted as a background for selfies later during the symposium. Miller can provide fun and informational needs for any event. 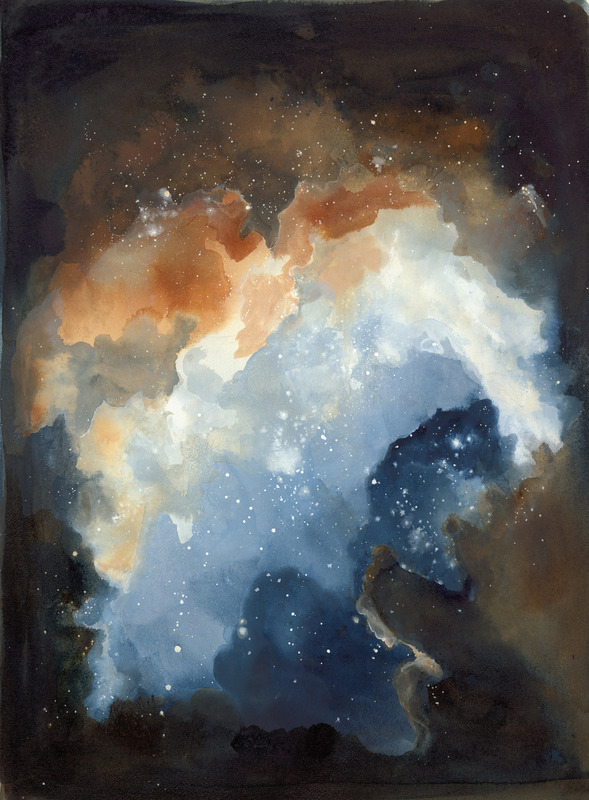 The interactive aspect of the Soundwave Art App elevated the reach of the marketing of the symposium. It allowed Raise Your Hand to push their message further and provide opportunities for educators and administrators attending the event to interact with the content. 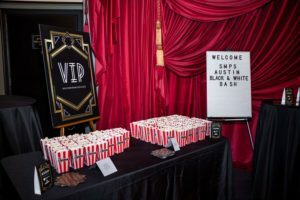 The Society for Marketing Professional Services (SMPS) hosted their annual Black + White Bash at the Austin Film Society on January 17th. Over 200 people attended the Old Hollywood themed event and celebrated the winners of the SMPS Member of the Year (Janki Depalma), Community Service Award (Tahnee Sauer), and Leadership Award (Paulette Gibbins). Miller IDS not only had the honor of printing all the signage for the event, but several of our employees had the opportunity to plan and attend. The Black + White Bash is SMPS’ event of the year and highlights the hard work, leadership and community development of their members. This year’s event space, a cinema, provided a few challenges for the planning committee including not being able to hang anything on the wall. Miller and the SMPS committee worked to find a unique way to display sponsors, food, and awards. Our sales and marketing associate, Lauren Bastiaans, along with our account manager Ryan Bruce worked with the committee utilized the open floor space to create the Old Hollywood theme here in Austin. To present and show off past winners of each award, Miller printed floor decals in the shape of the classic Hollywood stars on the Hollywood Walk of Fame. 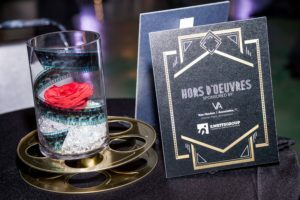 The 2019 award winner names were covered as guests entered the hall and the names were revealed during the awards portion of the night. 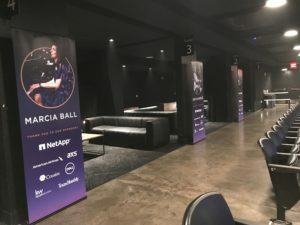 The committee also decided to use gobos (a stencil or template placed inside or in front of a light source and projected) to project the event sponsors onto a wall and Miller printed large customized foamboard signs to cover around the gobo areas to act as a border around the devices. 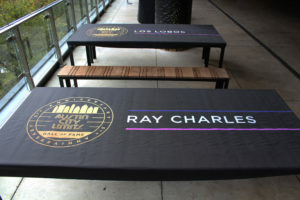 In addition, Miller also printed smaller foamboards to highlight the entertainment, award, walk of fame, photobooth, food and drink, and print sponsors. 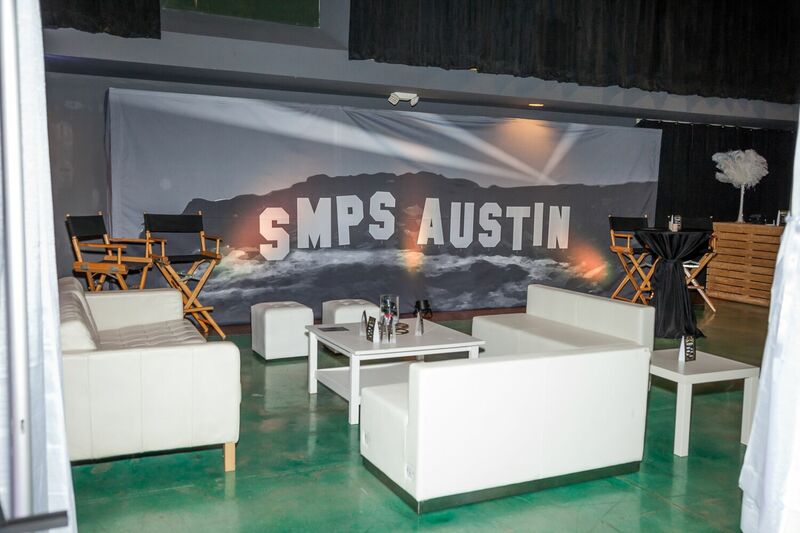 The piece de resistance (and our favorite), however, was the 8’x24’ hop up that featured the custom designed Hollywood sign-inspired SMPS Austin banner in the VIP area of the bash! We are grateful to have worked with SMPS for the last six years as an in-kind print sponsor. 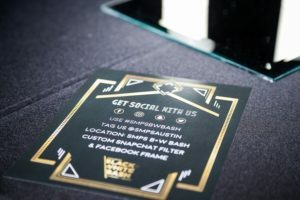 Be it luncheons to the Black + White bash, we’ve enjoyed planning, printing, and being able to interact with some of the brightest and forward thinking marketing professionals in Austin and the A/E/C industry. A special thank you to Rachel Paul Photography for the great pictures throughout the night! Miller IDS is excited to see Cypress Real Estate Advisors (CREA) show up on our radar again with a unique project at their headquarters here in Austin. CREA is a creator of places, their spaces bring people together in mixed-use developments that transform the urban landscape. 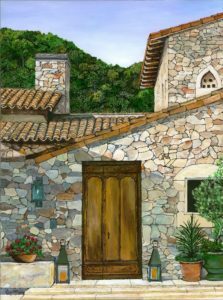 CREA places an emphasis on corporate social responsibilities by holding themselves accountable for the impact of their project on the surrounding communities. 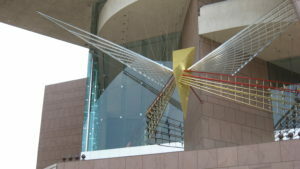 CREA has developed in 17 major US cities since 1995, including ATX. 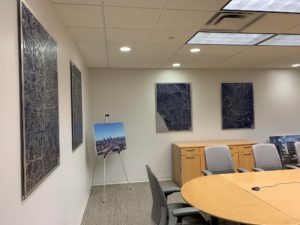 Recently, their marketing team created several large maps of cities they had developments in that purposefully left the names of the cities off so that people could guess. This project, located in their main conference room, engages with any customer or colleague that enter the room and shows off their growth with an out-of-the-box approach. Want to guess which cities are which? 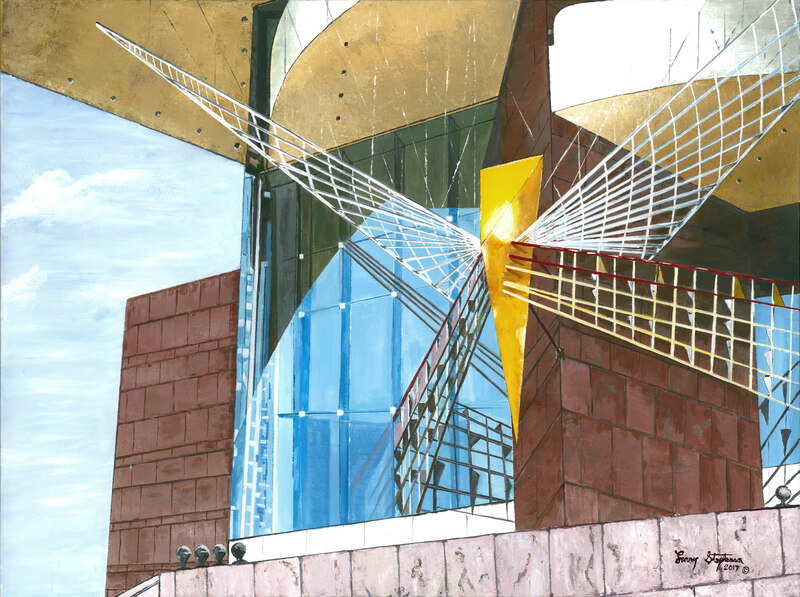 The cityscapes are directly printed onto a brushed aluminum composite material, which reduces glare, but adds an eye-catching and modern twist to indoor signage. 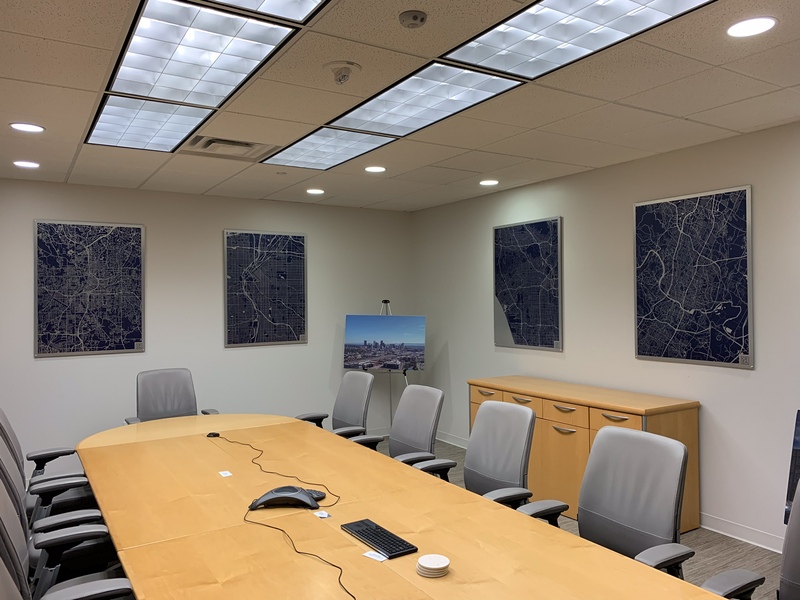 Both Ryan Bruce, Miller IDS Graphics Account Manager, and Micah Frugia, Miller’s Graphic Designer, worked with Kenzie Sheppard and the marketing team at CREA to design and print the perfect city maps. 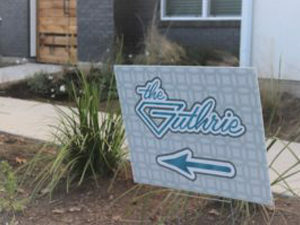 The material is incredibly durable and a different style of signage, which provides a bit of pop and luster to your marketing campaign. Miller IDS’ own marketing team was very excited to see CREA’s project come through our doors and has inspired us to update our own signage at our stores. We have also watched CREA’s newest apartment complex, The Guthrie, shoot up close to our downtown location and are excited for its’ opening. To read more about their latest project on the east side, click here to go back to our July 2018 article. Earlier this year, Miller IDS highlighted and celebrated Sabre Commercial’s 10-year anniversary as a leader in the Austin commercial construction industry. Sabre is a company founded on collaborations with the best local industry talent, setting the bar high for quality work, running safe job sites, and maintaining ethical business practices. 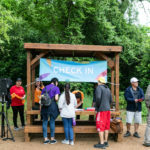 Sabre focuses on engagement within the communities it serves in San Marcos and Austin, an approach taken this past month at the Circuit of the America’s Formula 1 event. Miller IDS has worked with Sabre throughout its 10 years in business, and today working on everything from construction documents to large-scale job site signage and marketing materials. At Miller, we’ve loved working with Sabre from concept to completion on their Formula 1 tent signage. For the fourth year in a row, Miller designed and printed signage that incorporated their anniversary while emphasizing the overall theme of F1 racing. The interlocking system of racetrack-related icons was not only visually appealing, but also highlights Sabre and their tent sponsors. 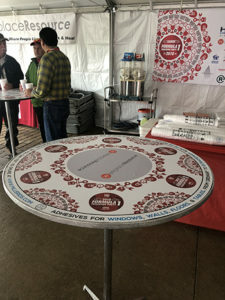 Miller printed individualized name badges for each attendee, custom table toppers, and banners that displayed sponsor logos throughout the tent. We also had the pleasure of Sabre inviting Miller IDS’ employees to join the event! Our accounting manager, Kim Hilscher and her husband, as well as our technology sales and service manager, Jeff Stewart, enjoyed the Sabre Commercial tent too! 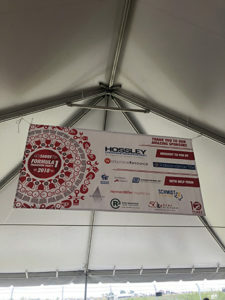 Thank you, Sabre, for allowing us to design and print for your F1 tent for the fourth year in a row and for your continuous business throughout the year! To read more about Sabre Commercial, click here. Photos courtesy of Kelly Maxwell. 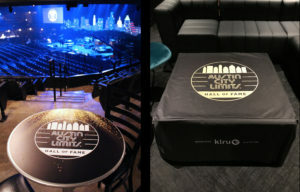 On October 25th, The Moody Theatre in downtown Austin hosted the 5th annual KLRU Austin City Limits Hall of Fame. This year inductees included musical legends Marcia Ball, Ray Charles, and Los Lobos who joined the ranks of other ACL Hall of Famers BB King, Bonnie Raitt, Kris Kristofferson, Willie Nelson, Stevie Ray Vaughn & Double Trouble, and others. Hosted by Chris Isaak (who also performed), the 2018 ACL HoF continued in tradition by honoring musicians who have made a great impact on the music industy. 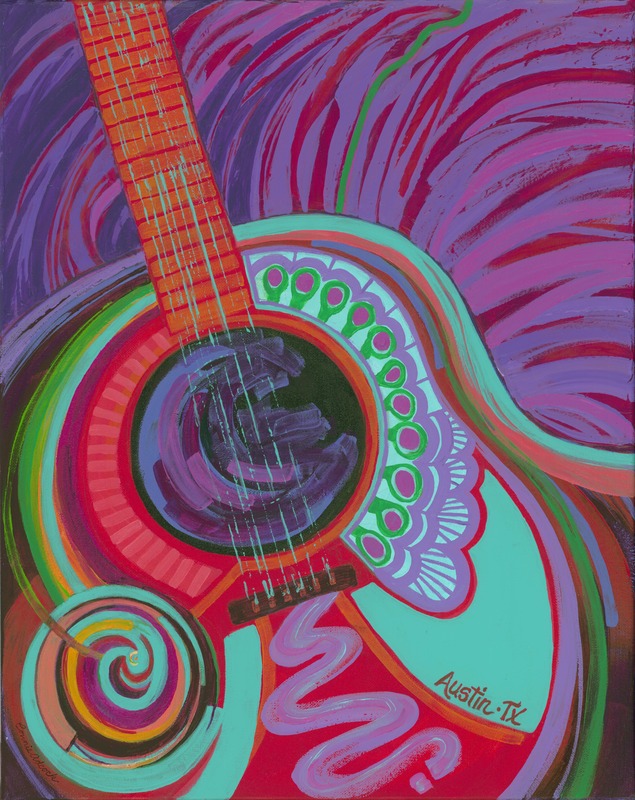 Additional performances this year included Norah Jones, Ray Charles’ Orchestra Keyboardist and musical director Dr. James Polk, Boz Scaggs, Gary Clark Jr., Austin’s own Ruthie Foster, New Orleans Soul Queen Irma Thomas, Tracy Nelson, Lou Ann Barton, Shelley King, Carolyn Wonderland, and many others. 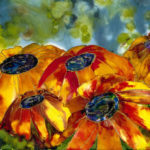 Proceeds from the event benefit KLRU-TV, Austin PBS. We were excited to provide print sponsorship for ACL HoF for the third year in a row. 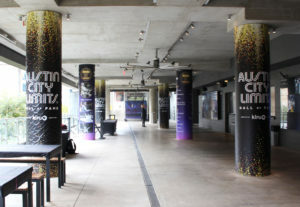 KLRU worked with both our graphics account manager, Ryan Bruce, and our graphics operations manager, Ozzie Guzman, to provide colorful and exciting signage for both inside and outside of The Moody Theatre. 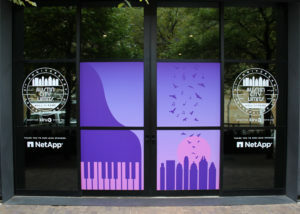 As they walked up the stairs, guests were greeted by custom vinyl window decals and wrapped poles that celebrated past inductees. 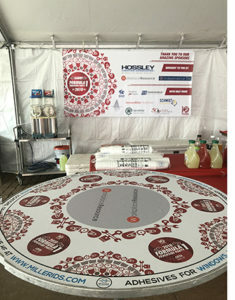 Additionally, we printed fabric table covers, banners, and retractable banner stands that highlighted this year’s inductees and magnetic high-top table covers, which can be re-used for future events. 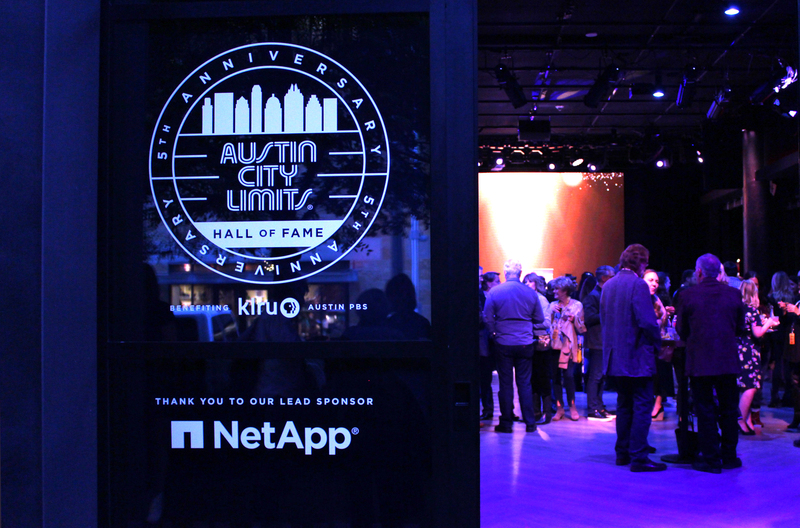 Miller IDS is a proud supporter of KLRU ACL HoF as well as KLRU NEXT, a young professional’s group with a focus on the arts, public issues and education in the Austin community. The ACL Hall of Fame was taped live and will premiere on New Year’s Eve on your local PBS station. To read more about the event, click here. Photos courtesy of KLRU, Ozzie Guzman, and Ryan Bruce. 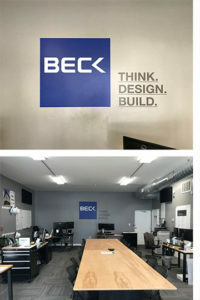 The Beck Group has an exciting project at 2010 East 6th Street in the heart of growing East Austin. They’re currently designing and building the office for developer Aquila Commercial, which will be home to GoDaddy’s Austin office. As Beck wanted the logo to be visible to pedestrian traffic on 6th Street, our Miller IDS team installed a 4′ vinyl Beck logo on the prominent back wall of the office space. As East Austin continues its transformation, we’re happy to help you add your mark to Austin’s hottest neighborhood. Our team at Miller IDS recently completed an important project to help improve a campus experience while keeping students safe. 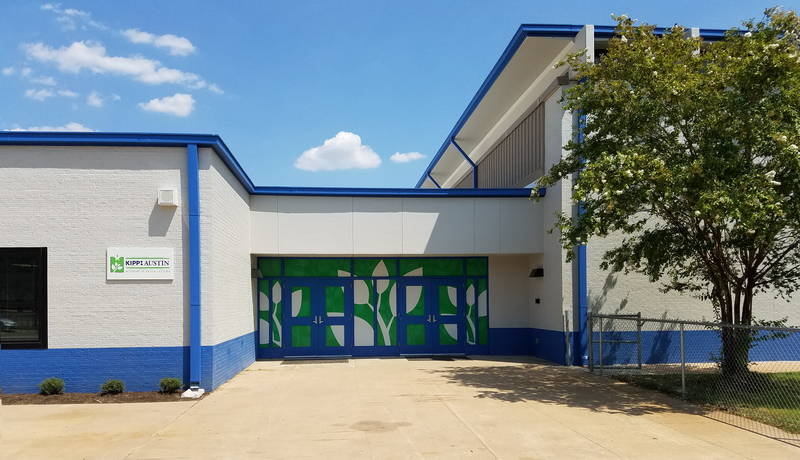 KIPP TX, a non-profit, public charter school, had the twin goal of adding eye-catching graphics to identify campus entrances while also providing a heightened level of security. As a forward-thinking educational organization, KIPP recognizes that among many factors, safety and security are key to providing an effective educational environment. 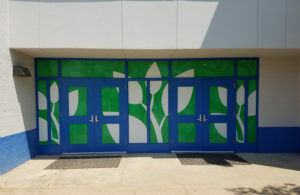 To assist school leaders with the development of a distinct and visually appealing security solution, we worked with the school and American Constructors to create custom-designed, printed window film that highlights the entrances to two middle and two elementary schools in the KIPP TX – Austin Region. Each design features the individual school logos, which assists in entrance identification and school identity. The perforated window film allows visitors, students and faculty to enjoy the uninterrupted view of the collegiate style campus from inside; Building occupants have the comfort of knowing that visitors cannot see inside and that faculty can see visitors as they approach the building. We thank both KIPP and American Constructors for connecting us to this purposeful project. To learn more about how KIPP schools empower students to graduate from college, click here.